AlterG®, creator of the Anti-Gravity Treadmill®, announced today the launch of Via, the latest advancement in body weight supported therapy using Differential Air Pressure (DAP) technology now with fully integrated Stride Smart Technology and the AlterG Assistant. 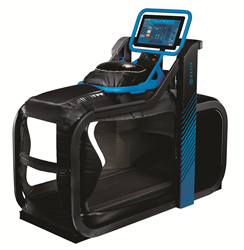 By integrating the Anti-Gravity Treadmill with Stride Smart’s gait analytics, video monitoring, pain recording, and pre-programmed therapy sessions into an intuitive touchscreen user interface, the all-new Via makes it easier than ever for clinicians to objectively assess the direct effects of unweighting on therapy in real-time to help patients and athletes achieve their optimal outcome. The Via Anti-Gravity Treadmill from AlterG represents the most significant advancement in the company’s near history, providing a rehab and training experience unlike ever before. Using NASA developed Differential Air Pressure (DAP) technology, Via unweights users to as little as 20% of their bodyweight, enabling an adjustable reduction in impact and gravitational force while walking, running or during stationary exercise. The integration of Stride Smart gait analytics to measure gravitational load and provide simplified visual feedback on gait symmetry and pain levels, allows therapists to leverage objective data to work on improvements with users in real time. The AlterG Assistant goes even further to allow clinicians to choose a pre-programmed therapy session for their patient, or to design and save one of their own. The Via 400 is available in three models; the Via 400 and 400M are designed for physical therapy and rehabilitation applications with top speeds of 12 miles per hour forward and 3 miles per hour in reverse. The Via 400X has been designed for more intensive sports performance and athletic training applications, reaching top speeds of 15 miles per hour forward, and 5 miles per hour in reverse. Via Anti-Gravity Treadmill demonstrations are available now. For more information on the Via Anti-Gravity Treadmill visit http://www.alterg.com, call +1.510.270.5900 or contact marketing@alterg.com. AlterG uses gravity-defying technology to inspire and empower people to get better at what they’re passionate about. With the use of innovative Differential Air Pressure (DAP), we enable people to move in ways they could never have imagined – to recover, maintain, and enhance their physical function for mobility, wellness, and health. Our Anti-Gravity Treadmills use patented Differential Air Pressure (DAP) technology, originally developed at NASA, to comfortably and precisely unweight patients to as low as 20% of their body weight, enabling them to walk or run with reduced impact. The Bionic Leg, designed for patients with neurological and orthopedic gait disorders, is a robotic assistive device that is activated by patient initiated movement and provides stability and assistance for a full range of mobility training. AlterG products are found in thousands of leading sports and physical rehabilitation facilities worldwide. Learn more about AlterG at Facebook, Twitter and on the Website.